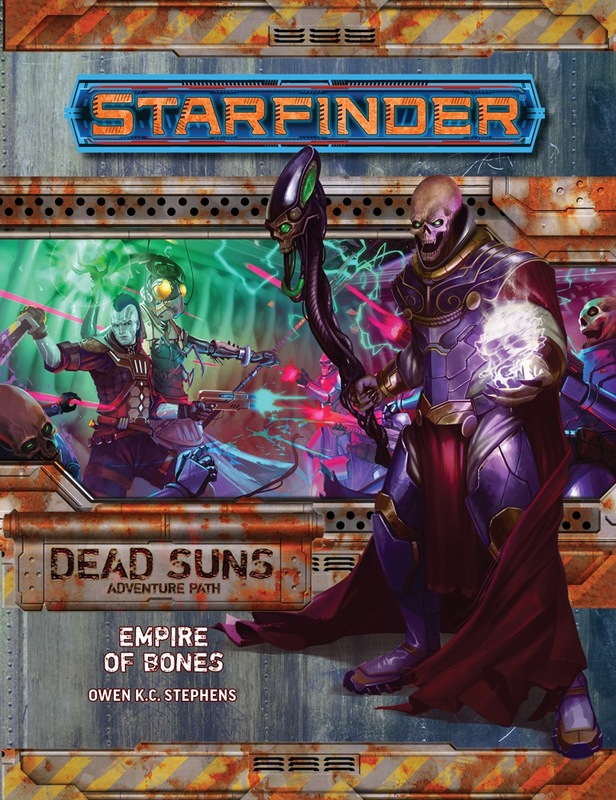 Empire of Bones is sanctioned for use in Starfinder Society Roleplaying Guild. Announced for June 2018! Image and description are provisional and subject to change prior to release. Looking forward to people's reactions! This is gonna give me flashbacks to Mothership Zeta. Nice a proper epic ending to this. Like it! Whats the final level cap for this campaign? Its a bit lower than most of Pathfinder APs right? The adventure should take you to 13th, if my manuscript is to be trusted. Cool, thanks for the info Owen!! I see the PCs are expected to perform the ol' Samus Aran method of bad guy disposal. Turn your Starfinder Core Rulebook to page 236 for a closer look! I also wonder what the onther articles will be, also are they doing a continuing the campaign? Our what if the heroes lose? I can tell what those are based on the previous volume's preview. Yes, there is continuing the campaign article, rest of the articles are ships of the corpse fleet and ships of the line which includes "Sometimes battleships and dreadnoughts just aren’t big enough! This article presents new rules for starships of extraordinary size and power capable of acting as mobile bases for entire fleets"
Wow. That alone might make this worth getting! Any word on whether the Alien Archive will include a new player race or if they'll be giving that a break after dropping 5 in the last one? Would be symmetrical, if nothing else. No new races in books 1 or 6. To be frank, the woioko (from AP #2) should have been in #1, to go with the description of their planet in the first volume's Codex of Worlds. Similarly, we have a new planet in this volume's Codex of Worlds with a new playable race to go along with it! You know, I got that impression, actually. About the woioko, that is. And I for one am glad to hear that there'll be yet another new race in this coming book. Honestly I kind of hope there are new playable races in the majority of AP's going forward. Not *every* new volume will have a new playable race, but a lot of them for the next year or so will! This is mostly speculation on my part, but was the Woioko left out of the first book because you didn't want to include any new playable races right on release and/or were waiting for the Alien Archive to drop? That would make sense to me but I don't know the full story so thought I'd ask. It's much more than since Alien Archive wasn't out yet, we pretty much needed ever monster slot in the back of the book to be used for things in the adventure itself. So now the question is whether the new player race is the crystalline humanoid or one of the plethora of undead monstrosities. What I love about this game is that I genuinely do not know the answer. I suspect it's the crystal but it could go either way. Stuff like this is mentioned in the adventure path drift article. To keep a fleet together during the drift you need to have them all linked up or docked to one ship so clearly there are some monstrous ships out there to work as fleet carriers. Iiiiit's June! Crazy excited to read this. We're in book 4 and intend to continue on past level 13 after this conclusion. I've been very curious how to twist the character's backgrounds up into this conclusion for future story arcs and what the continuing campaign article holds. The guy on the cover is exactly what I was hoping for though, it's building up to be quite the exciting path. Uuuh, did I miss announcement about shipping orders being later again? I guess its summer after all ._. Shipping starts either tomorrow (june 14th) or friday, june 15th. I believe to remember that it was similiar last year after Paizocon, which is quite understandable. I imagine Gencon will have some repercussions too. Paizocon or not, this feels like a pretty normal timeframe for a shipping window for me. Given it is just past Paizocon then grateful to the Customer Service / Warehouse teams for making this happen. Just got my subscriber download but no time to jump into it. a super fast skim peaked my interest. Sorry for just a tease got to work and prep for starting book 3. It is still good to know that shipping has actually begun. Now I know that there is a point to checking for my PDF periodically. If anyone does get an early copy and feels like sharing, I'd really really like a spoiler for Corpsefolk. I usually get my shipping pretty late in the cycle and don't want to wait. Care to share that spoiler? A friend got his shipped today, Corpsefolk aren't playable. Got my copy and I have to say I love this book! The feel of the whole adventure is great, and the support articles were a really cool read. Looking forward to seeing what great stuff you guys do in the next AP! Part of me did, too. But the rest of me was hoping that I was wrong. Could somebody spoiler how you can continue the campaign & what happens if you fail? The book gives a few smaller examples of ways you can continue the campaign (investigating the Kishalee civilization or tracking more superweapons for example) and gives further details on two specific ways of continuing things. One involves facing an incredibly powerful atrocite who tries to turn the 12 suns system into a superweapon, the other involves tracking and facing a creature from Abaddon that was coincidentally freed by the destruction of the 12 suns demiplane and is now destroying the ecosystems of planets across the Vast. 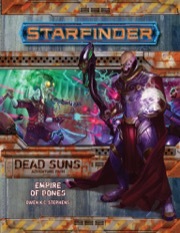 If you fail, either the corpse fleet or Cult of the Devourer get the weapon (depending on GM choice) and end up using it to cause untold destruction, it's also heavily suggested that further attempts to face the Corpse Fleet would involve facing off against the reanimated forms of fallen party members. Would anyone mind giving us a peek at the bestiary (the names of each monster, CR and monster type)? Anyhoo, after reading this through, I can safely say that final two books are best books in Dead Suns ._. I mean, its mostly action, but its REALLY cool climactic action with cool encounters and cool personalities for the named baddies. All three main officers you face aboard the ship have chance to shine their personality in nice ways. My favourite being this being example question for one of them: "Why do you talk so much during the fight?" I also love that their explanation for "Why is the ship controlled easily from single location? Isn't that unsafe" is basically "At that point where enemies have taken this place over I'm already dead so why would I care?"